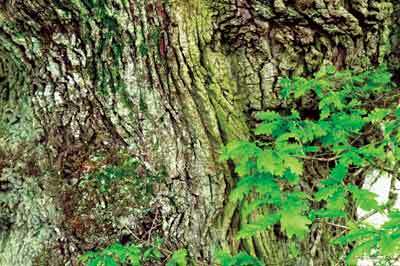 There are apparently 530 species of oak worldwide. 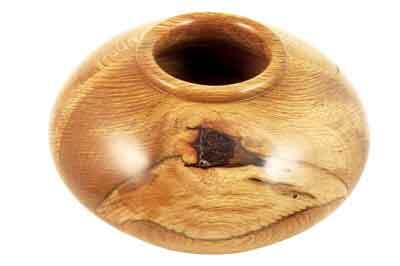 The two main types known as English oak (Quercus robur and Quercus petraea) are the pedunculate and sessile oaks. In practical terms there are no obvious differences between the timbers of either and these same two oaks are dominant in France and other European countries who each call them by their own country name, so we could lump it all together as European oak. However, the hardest and toughest timber is from areas where it grows more slowly, say on a latitude north of the English Channel. 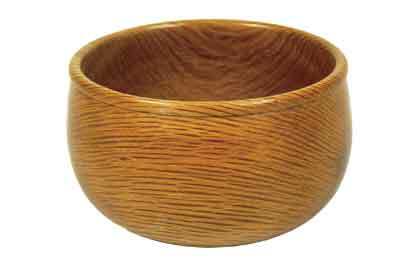 I have to say that plain oak does not do much for me as a turning timber. For furniture and cabinetmaking it is still among the most popular, and most of what we sell is used for this purpose as well as a perennial demand for church candleware. Burrs, pippy lumps, brown oak, iron stained oak, rustic old recycled bits and even holm oaks (Quercus ilex) appeal more to me. 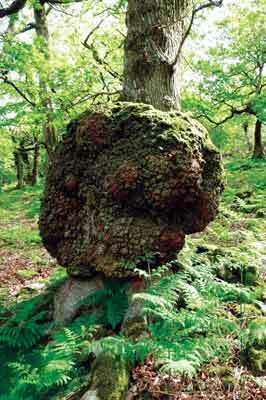 Brown oak is caused by the beefsteak fungus (Fistulina hepatica), causing the timber to turn a deep chocolate brown. 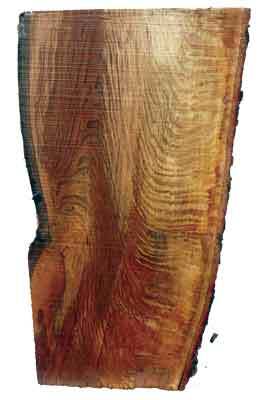 This timber is a real prize and anything made from it has a warmth and depth of colour that is difficult to produce artificially. 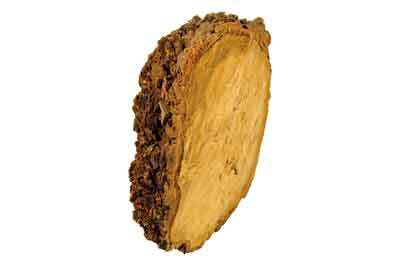 All timbers are best felled during the winter but oak is often felled all year round. It is a timber that does not like to be dried quickly, so winter milling is essential and allows the initial drying to take place more slowly during the colder months. We normally air dry for two summers before kilning 25mm and 50mm planks. 75mm is the thickest we mill to and this is left to air dry for three or four years. Anything over 75mm thick can be a problem to dry without checks and can take over five years to dry. 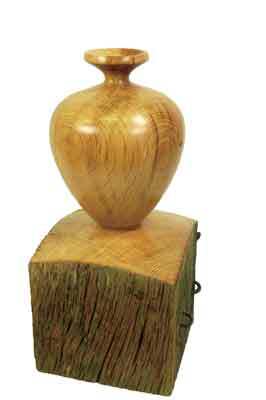 English oak is not a particularly difficult timber to turn. 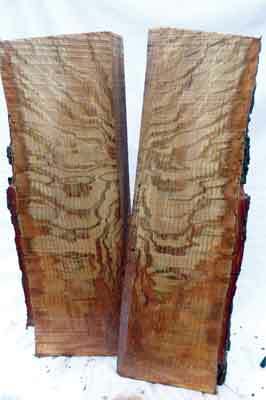 It can be fibrous and requires careful cuts with sharp tools to avoid end grain tear on faceplate work but on spindle work, it is a fairly easy timber to cut and shape. 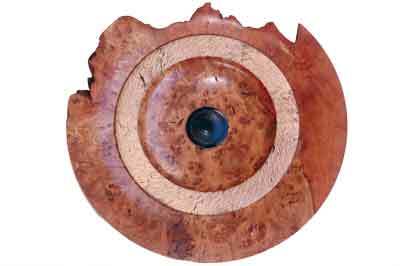 The timber has a high tannic acid content - hence the use of oak bark for tanning leather - which reacts quickly with any ferrous metal, so when turning oak with a high moisture content or even fresh sawn for part turning, take precautions to protect the lathe, chuck and tools from turning blue to black or rusting overnight. A spray all over the lathe, chuck and tools with something like WD-40 works well. 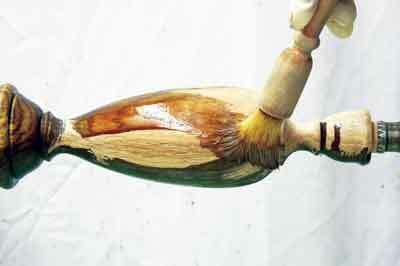 Some clingfilm or polythene over the chuck grip is another useful precaution to save staining the wood and the chuck. 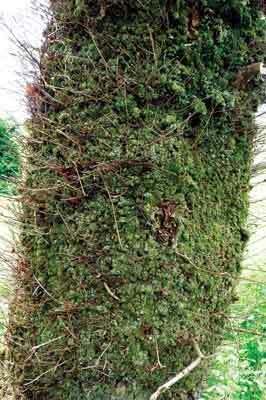 Burrs or pippy oak should not cause a problem to sharp tools with good technique but patches of burr can cause huge imbalance. Brown oak turns easiest of all. I'm not quite sure why, but the beefsteak fungus seems to impart a waxiness to the wood. Cabinetmakers say it planes easily for the same reason. Oak will take a huge range of finishes including oils, cellulose and acrylic products. Oils are always easier to use on burrs as any over-application soon disappears among the knots, but hard sealers like cellulose and acrylic can be applied then buffed back to a satin finish. 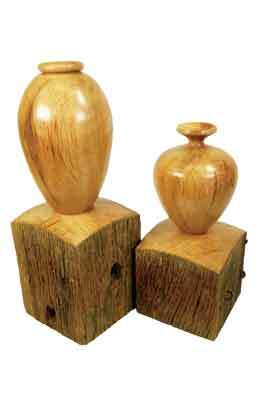 One other finish I have found to work only on oak and sweet chestnut (Castanea sativa) is Briwax. 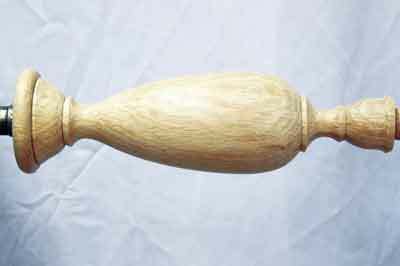 Most waxes need to be applied to a base of some kind, much as paint needs a primer/undercoat, but a heavy coat of Briwax buffed on the lathe or with bristles in a drill gives a nice shine that lasts well. It can also be reapplied later if necessary. 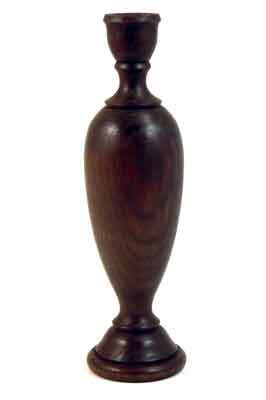 I used this method on the gatepost vase shapes. This is fun and safer than fuming oak in ammonia as cabinetmakers have done over the years. This vinegar solution will darken the wood as the iron reacts with the tannic acid. Take a bottle of vinegar, remove the bottle-top and force as much wire wool into the bottle as you can. Leave it for a couple of weeks for the vinegar to dissolve most of the metal from the wire wool, then pour this iron-laden vinegar through a fine strainer into a sound plastic bottle. Turn and finish the piece using your normal abrasives. If you are using a chuck or drive centre, protect it in some way from the vinegar, such as clingfilm in the chuck grip. Whether or not the chuck grip is to be removed, the base will need to be finished separately. Put a cloth or polythene sheet over the lathe bed bars to protect these too. Alternatively, the piece can be removed from the chuck and balanced on the tips of a tripod of three pins knocked through a thick card after the solution has been applied. Using a brush, apply the solution liberally until it is soaked all over. Don't put a metal encased paintbrush in the jar as I once did, or you'll come back to just some bristles and a handle a few months later! At this stage it looks like an awful patchwork as the first applied areas react quickly, but be patient, the colour will balance out in a few minutes. First the wood will turn dark green, then blue and over a few hours/overnight, black. If the piece is fixed in the lathe, the colour change can be arrested by simply buffing it dry with a clean rag, but it will still need to be left overnight to fully dry. 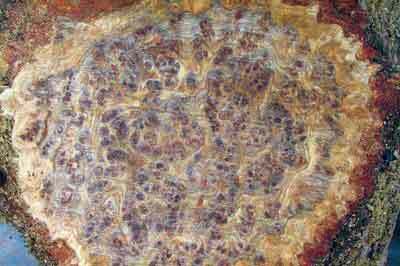 If it is left to darken to black, the wood will be covered with a fine dark powder, even some fine crystals. Buff it hard with a rag-making sure to clean right into any features. It might need a fine abrasive - 400 grit or finer - or the rag might have done the job, so now is the time to apply your preferred finish. I use a quick-setting one like cellulose sanding sealer, then a paste wax. This method can be used on - among others with a high tannic acid content - sweet chestnut, false acacia (Robinia pseudoacacia) and walnut (Juglans regia), to name a few. Most of the abrasives we use nowadays originate from the motor trade so all will remove timber easily. 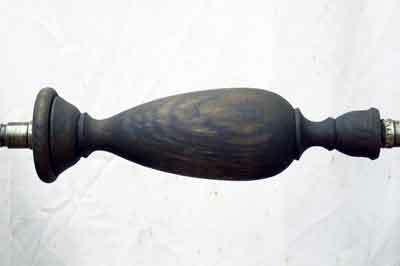 Sanding with lathe power and then stopping it and sanding with the grain by hand always gives the best results. Do this with successive grades from, say, 120 through to 320 grit. Wire wool, being made of ferrous metal, is not a good idea with oak as the timber is ring porous so will always have areas where the wire fibres will hang up and stain the wood. When power sanding burry pieces, especially blanks with patches of knots, be aware that these are effectively end grain so will be harder than clear grain. Power sanding can eat away more of these softer clear areas leaving hollows and misshaping the piece. A good alternative method is to use a hand sanding block. 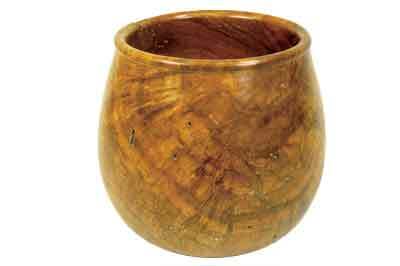 One of the fun aspects of woodturning, especially as a hobby, is the collection or salvage of timber to take home and use. It is a different ball game to producing blanks commercially in that the cost is usually just labour and maybe a turned gift or a beer, but the rewards and risk can be high in equal proportions. Holm oak, our only evergreen oak, is a perfect example of this. Not native to the UK and also known as the holly oak - Ilex being holly - it was introduced from the Mediterranean region in the 16th-century and is surely the hardest, most spectacular and most difficult oak to season. I am drawn to timber as a moth is drawn to a flame. Holm oak has the widest of medullary rays and such variations as each cut is made that it can on one cut look like snakeskin, the next like tiger fur and the next, have a colour range from dark brown to light brown and pale white sapwood. Irresistible. I bought my first holm oak trees in 1988 and the estate owner told me I was mad, as it was a timber only fit for burning but was so good in this respect that it was once used for smelting steel. We milled it into 75mm and 100mm sections and four years later were running the best fires ever on our log stove as plank after plank had buckled and warped and split and honeycombed. So the estate owner was right in both respects because about 10 years later I bought some more... This time we only cut 75mm planks, close sticked and stacked it in the dark away from much air movement and left it for six years. And this time we got some nice pen blanks and the best fires on our log stove. I think the best method with this timber is to either turn it green and thin, or part turn, leave it for a couple of summers then finish turn it. And accept that the odd piece will crack, buckle and warp.